The Hail Mary beads in this handmade wire wrapped Catholic rosary honoring St Therese are multicolored, faceted crystals. These beads are some of the most unusual beads I've ever seen. They are 8mm round beads, but the way they have been faceted makes them look almost like cubes with rounded edges. Also the facets are reminiscent of window beads. The facets have a high polish, while the edges are matte. This makes for a striking beads. Also, they have been covered with a multicolored coating which has topaz, smoke and rose tones. Accenting the striking Hail Mary beads are Our Father beads. These beads are 10mm almond colored Swarovski pearls. Swarovski pearls are high quality simulated pearls. They have 4 layers of nacre (pearly coating) over a Swarovski crystal center. This gives them a beautiful glow. In some lights the pearl appear to be gold, or tan with tones of pink. In other light, they appear to be a light dusty mauve. The center honors St Therese and is a third degree relic. The reverse side of the center has ground from St Therese's coffin. It is comprised of silver colored metal. The intricate crucifix is also comprised of silver colored metal. The wire is German silver which is also known as lead free nickel silver. This rosary would make a wonderful gift. It would also be great to keep for yourself. If you hold the middle of the third decade in one hand and the end of the crucifix in the other, this rosary is 31 inches long. Most people feel that this is too long to wear as a necklace. This rosary is handcrafted and is brand new. ABOUT UNBREAKABLE ROSARIES: This rosary was constructed in such a manner as to make it unbreakable when used for prayer only The tarnish resistant, German silver wire is coiled 2 1/2 times at either end of each bead. Furthermore, the interlocking loops prevent the type of breakage that occurs with most traditional linked rosaries. 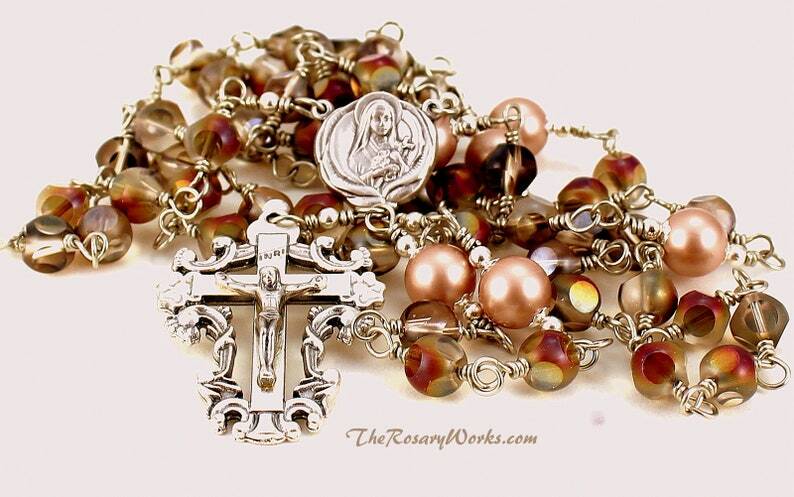 This rosary is so well made that with the care you would normally give your prayer beads. GUARANTEE: I am so confident in the construction of this rosary that I will be happy to repair it for free if it should break with normal wear and prayer. Please note that while I absolutely guarantee the construction of this rosary, since I didn't make the beads, I can not guarantee the beads. Please take care of the beads and the pearls in this rosary.